Store your soft or rigid gas permeable contact lenses with our branded Feel Good Contact Lens Case, an essential eye care accessory to use part of your contact lens cleaning routine. 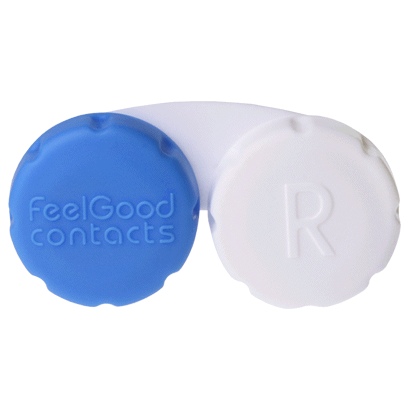 Feel Good Contact Lens Case is ideal for two weekly or monthly contact lens wearers, to help keep your contact lenses extremely fresh and hygienic. The case has an R inscription – for ‘right’, to show you where to place the correct contact lens for the corresponding eye. For use, fill your freshly cleaned lens case with your suitable multi-purpose solution, place your contact lenses inside and close tight. Hydrogen peroxide solution may even be used with the case, provided a neutralising tablet is added to ensure your contact lenses are safe to wear. Alternatively, this lens case can be used as a handy compartment to rinse your contact lenses with saline solution, making this a versatile product to suit all you eye care needs. Maintain exceptional hygiene and clean your Feel Good Contact Lens Case after every use. Simply rinse your case with fresh solution to remove any remaining old solution and regularly replace, at least every 3 months.